At some point or other, we all experience change. But change wears many masks. 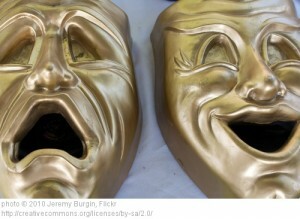 Like the two faces of the theatre. There’s the category we call good. Falling in love. Winning the lottery. And then there’s the bad. Sickness. Losing money in the stock market. We grow up believing that the two are juxtaposed to each other. One can cause spontaneous fits of laughter and good cheer. But seldom does the side we call “bad” cause bursts of the giggles. Two sides to the coin we call life. There are good days and there are bad days. And I for one, have learned not to cheat tragedy out of it’s just rewards. When I’m down, I feel it only right to be very much down. I can remember the stereotype super hero who laughs in the face of danger. So what does it look like to laugh in the face of tragedy? It sounds a bit sacrilegious. But I have experienced such irreverence. Only a few days ago, my mother-in-law had a stroke. And in the midst of a high-stress, potentially tragic moment, laughter could be heard emanating through the thin veil of her ICU cubicle. And on more than one occasion. At first I thought it just a coping mechanism. And perhaps that’s part of it. But as I watched and listened, I realized it was deeper than that. A room full of people, who love each other, did what came naturally. The conversation did not change because of the surroundings. And as the days unfolded, the jokes kept coming. The doctor came in to check and asked my mother-in-law to open her eyes. She had been very groggy and dizzy and didn’t want to. The first time she ignored the request. The second time he asked she responded, “I’m paying a lot of money for this.” And the room broke out in chuckles. Laugher didn’t change the circumstance. She still had a stroke. But in the last few days I have learned a valuable lesson. The greatest tragedy is the loss of levity. Having a stroke isn’t funny. But the ability to find some small piece of humor in the midst of calamity makes the darkness feel not so oppressive. It’s like taking the reins of a run-away horse. We cannot control our circumstances but we can control how we respond. And maybe it comes down to Mary Poppins. A little bit of sugar helps the medicine go down. Recently a friend referred to me as a pioneer. I had to pause and ponder such an accusation. I forced myself to look beyond the stereotypical view of a pioneer. Remove the bonnet. Put in indoor plumbing. 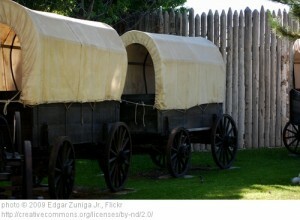 Replace a covered wagon with a Suburban. And sure enough, perhaps she’s right. Maybe I am a pioneer. We moved to a foreign and somewhat harsh environment. And we are learning new ways. For example, I cooked a pork shoulder in the crock pot and couldn’t bring myself to throw away the stock left behind. Saving two cups of left over pork stock is new to me. But perhaps even more shocking than saving it, is having a pretty good idea how to actually use it for consumption later this week. Trips to town are usually once a week and they are an event. Pa drives, we sing songs, and we buy what we need for the week. But the biggest adjustment is the swing from achieving to surviving. I have been struggling. Each morning I wake up and think of all that still needs to be accomplished before we can feel settled and immediately my body reacts. My heart starts beating faster. It becomes difficult to take a deep breath. I want to crawl back into bed and hide. Instead, I swing my feet into my slippers. Did I mention how cold it is? And I recite my new mantra. Wait a second. Um, isn’t that one of the slogans for AA? If such a saying is one of the pillars of recovery, and I repeat this saying to myself ad noseum throughout the day, does this mean I am in recovery? This pioneer woman had to stop and think. If I am in recovery, what am I recovering from? I sat down and braced myself for what was to come. An addiction? An addiction to what? My brain rattled a bit. The verdict hit me square between the eyes. And not just normal accomplishment. I’m talking the extreme over-achieving sort. Writing a novel in five months. Trying to remodel an entire house in four weeks. Is there such a thing as type A, extra bold and italicized? I’ve known this about myself for quite awhile. I’ve never seen it as an addiction. But when one is faced with the task of survival, achievement takes a back seat. Or maybe even gets drug behind. The once mundane tasks of life have grown monstrously. If I ruin dinner, the closest In-n-Out is 45 minutes away. Painting trim turns nightmarish when it takes three coats to cover the pea green paint. I want to see more accomplishment. But there’s not time for that in the midst of survival. I’ve thought about hiding under a rock, or more apt a tumbleweed, until we pass from pioneers to settlers. But there’s no telling how long that will take. And it won’t happen until all the green trim is painted. I’ve heard that recognizing you have a problem is the first step toward recovery. So, here’s to first steps! What’s your name and what are you addicted too?